In a market where gritty, magic-averse fantasy is now king, there are still strong hill forts where high fantasy storytelling thrives. Ian Irvine is the lord of one such outpost, having amassed a legion of fanatical followers with his Three Worlds sagas. With over two million words under his belt, he knows how to spin an epic yarn and tell it with real gusto. That said, this first book in the Tainted Realm series starts sluggishly, and its lowly-slave-girl-with-secret-magical-powers plot hovers perilously close to cliché. Irvine, like Brandon Sanderson, is also a fan of excessive word replacement. Why say “magic” when you can use “magery”, or “prophecy” when you can say “shillilar”? It bogs down some intriguing world building as the subterranean empire of Cython unleashes its shriek-arrows and pox-pins upon the bleak, volcanic land of Hightspall above. This larger drama plays out around the stories of Tali, the aforementioned slave/mage and Rix, a Hightspall rich-kid. They're the two sides of the Tainted Realm coin, thrown together when Tali flees her underground prison and all hell breaks loose. It's fight and flight, kill or be killed, as the heroine hopes to avoid being recaptured and killed. Those Cythonian acidulators do sound nasty. 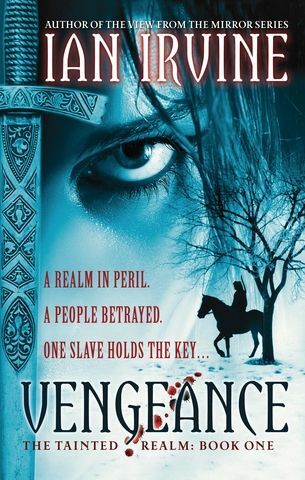 Vengeance is rich on detail, which will prove too heavy going for some. But once you force down part one, Irvine deftly keeps you turning the pages. Consequently, most of the grumbles you might have had about the tedious beginning are swept away by a book that's ambitious in scope and tirelessly action-stuffed. Read more of our book reviews .